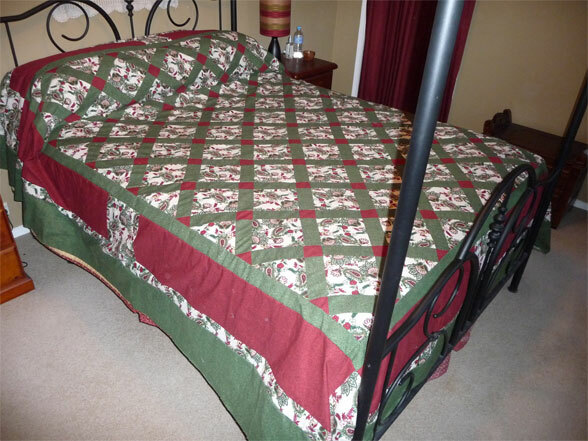 The jelly roll cost all of $30. It had been $60, but the sign said "50% off"! A no-brainer, as far as I was concerned. I grabbed it. 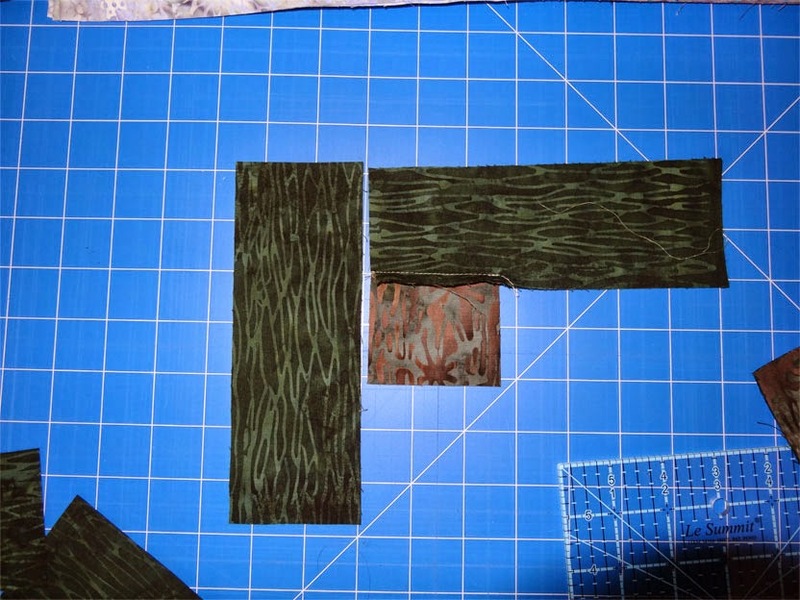 When I got home, I realized that I already had a length of mossy-green fabric which would blend nicely with all the prints in the roll! How's that for luck? And here I've flipped the roll around. See? Perfect! 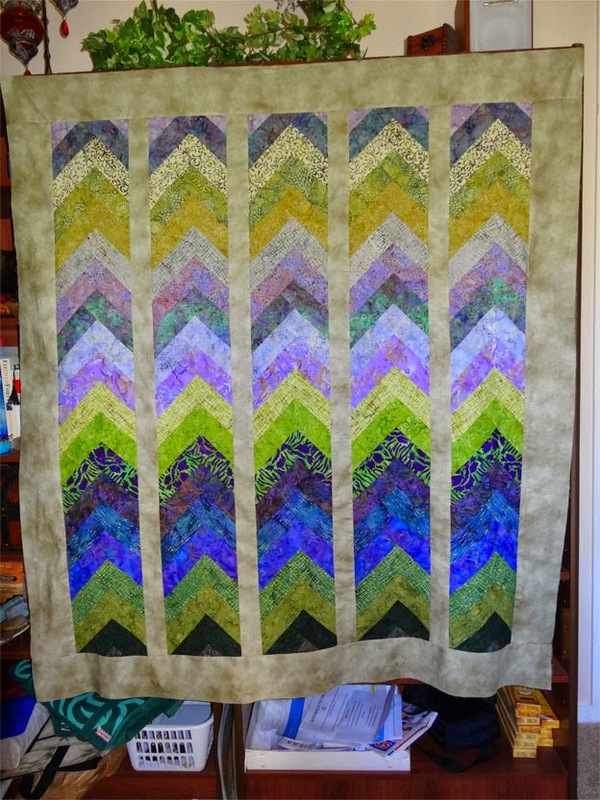 I found a chevron pattern online - liked the lookquite a bit - and so opted to go with a version of that. 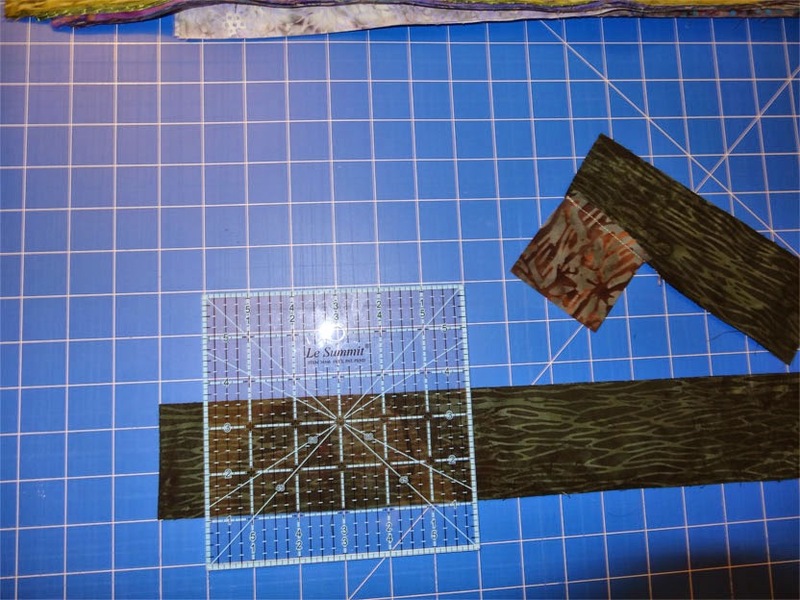 The pattern starts you with a 2.5" square, then stitching two 7" x 2.5" strips. 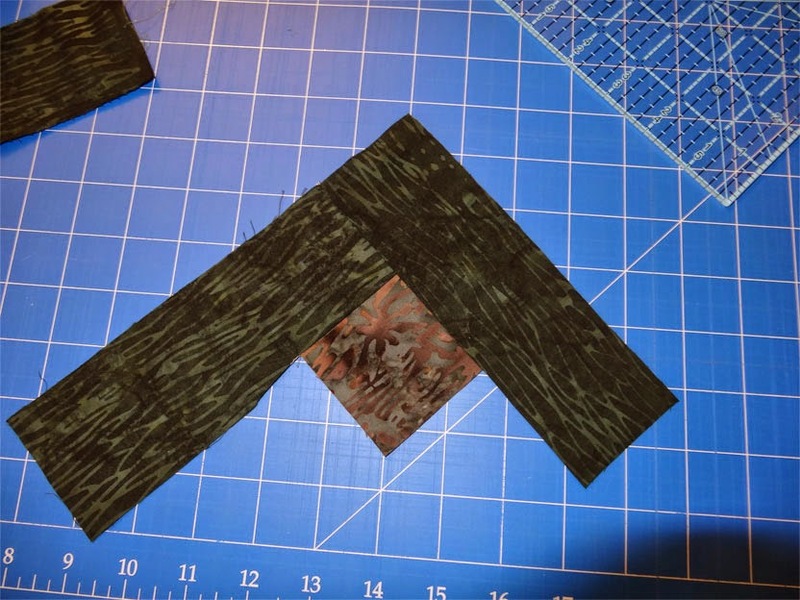 Below I've already added one 7 x 2.5" to my originating square - and I'm getting ready to cut out the next 7" strip. 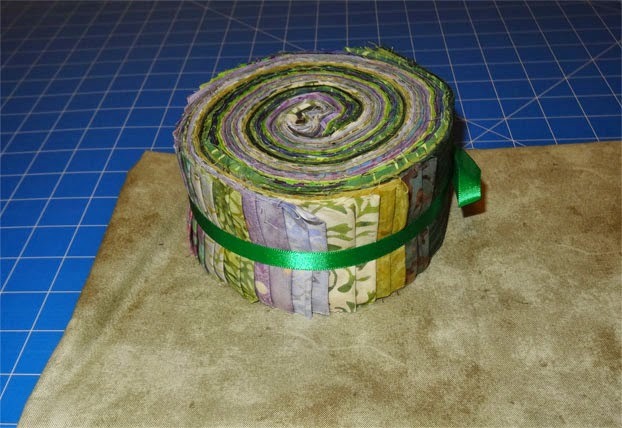 Jelly rolls are 2.5" wide - so there's no measuring needed for the width... just the length. 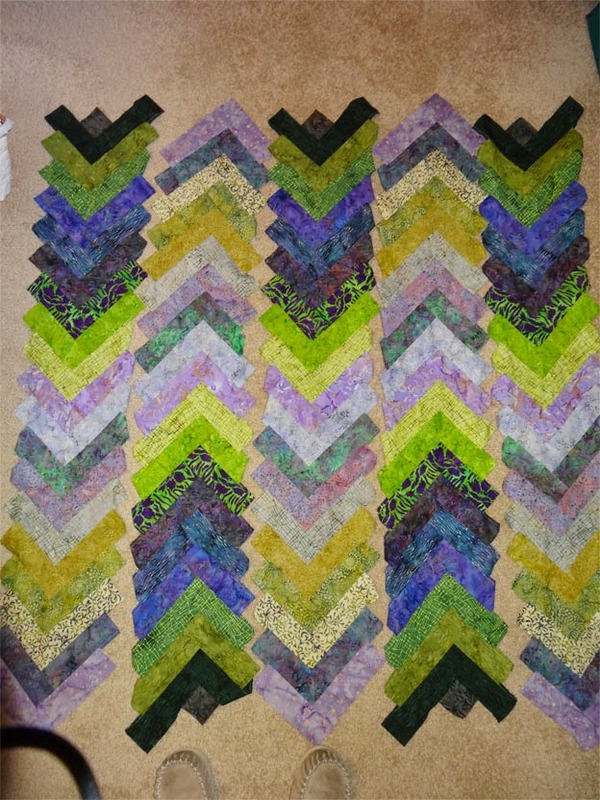 In the pic, below, I've set the pieces so you can see how the chevron is built. And here it is, sewn and pressed - viewd from the "right" side. After this, I just reached into the roll and extracted the next strip, adding a strip on the top left, then on the top right. Below I've got 5 panels built with the chevrons. I liked the arrangement of prints on the roll, so pretty much went with the order they came in. 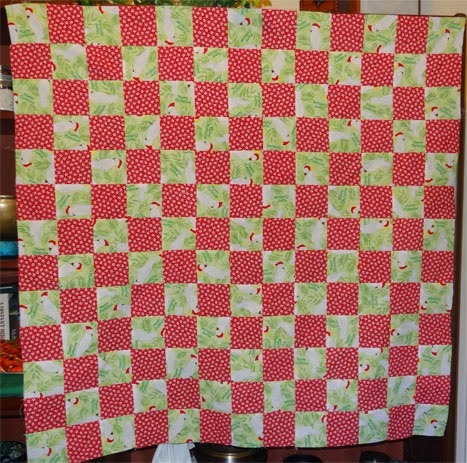 First I tried laying the panels in alternating directions. Hm... nope. Doesn't really look great. Then (below) I arranged them in the same order - YEAH! I like this a lot. 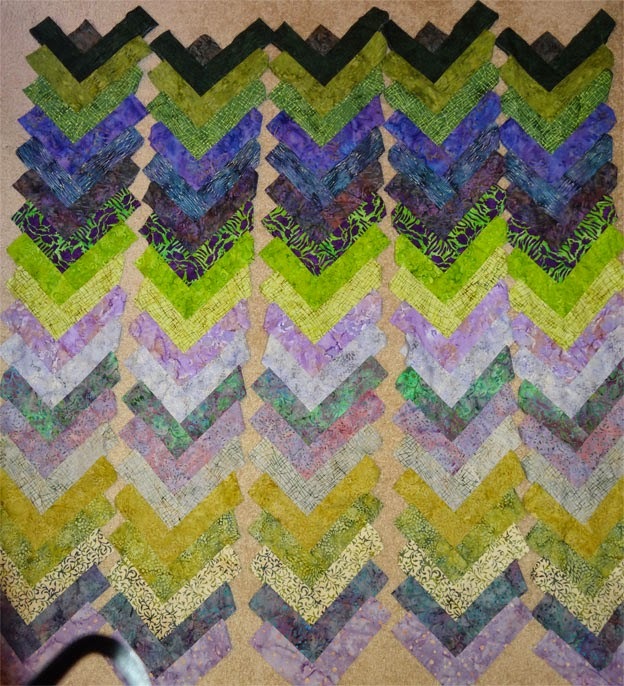 The pattern I've been looking at has you trimming the chevron panels and then sewing them directly together. I didn't want to do that - instead want a lattice to separate the panels. 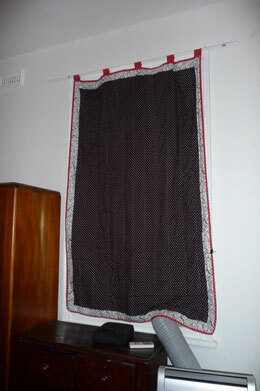 Below I've laid 4 of the 5 panels on the complimenting fabric to decide on the width of that lattice. 2.5" won the day. 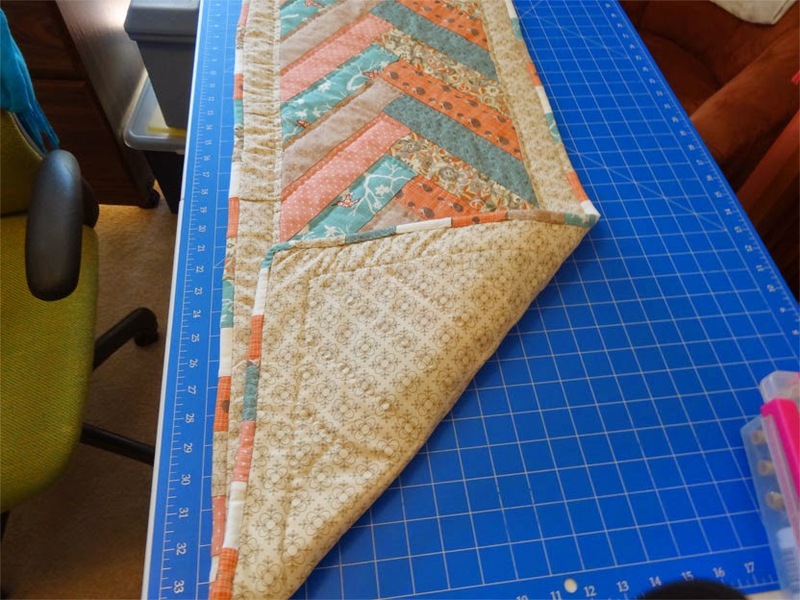 Same width as the chevron strips - HARMONY! And here's the finished top. The camera has altered some of the darker purples into blue below - what a shame, as the purples the eye sees are much more attractive than this photo demonstrates. I fell in love with the little "Cockatoo Santa" prints I found at Spotlight. They are just so cute. 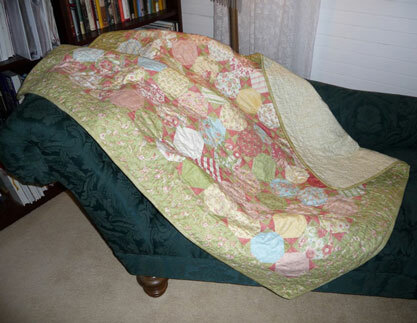 Last summer I pulled out the fabric and finally decided to do something - and chose to go with a tablecloth. 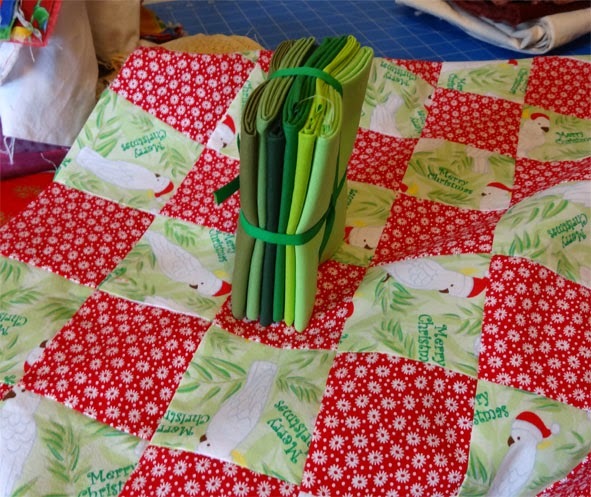 I didn't have enough of these prints to make an entire table cloth, so opted to just cut squares and stitch them together, taking care to make sure the birds are positioned so that they aren't all facing the same direction. Here's a closeup of the print - charming, yes? 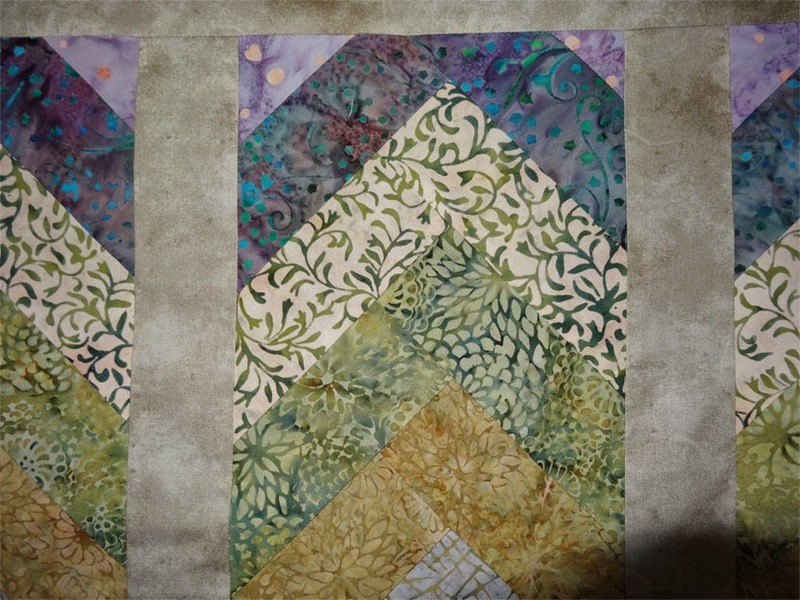 Now to figure out something to use as border fabric to extend the piece so that it's large enough. I had this bundle (below) but.. hm... I'm not sure this is what I want. What I think I'd really like is red and white striped fabric next, then maybe the green cut into small strips outside of that. But - realistically - can I hope to find a red-and-white strip which will match the red I've already got? Yeah. I'm dreamin'. 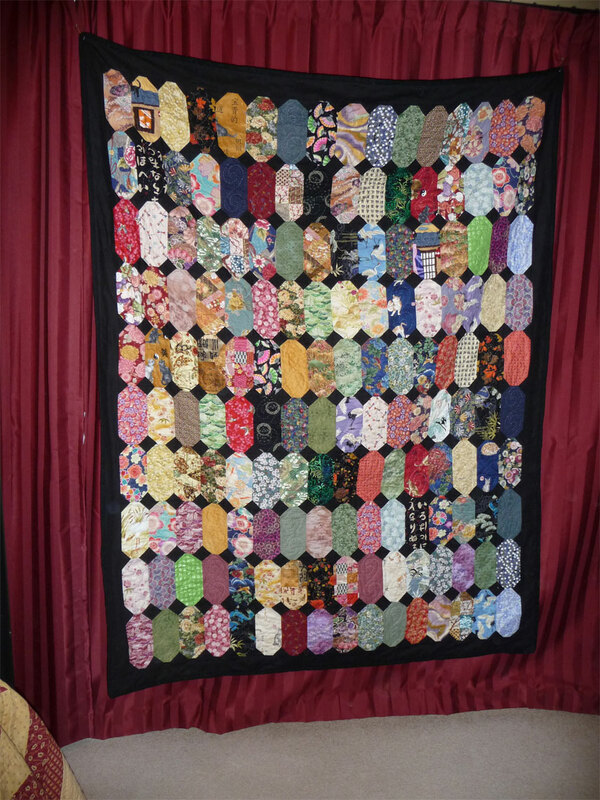 Well - the fat quarters I've had since just after Christmas 2011! 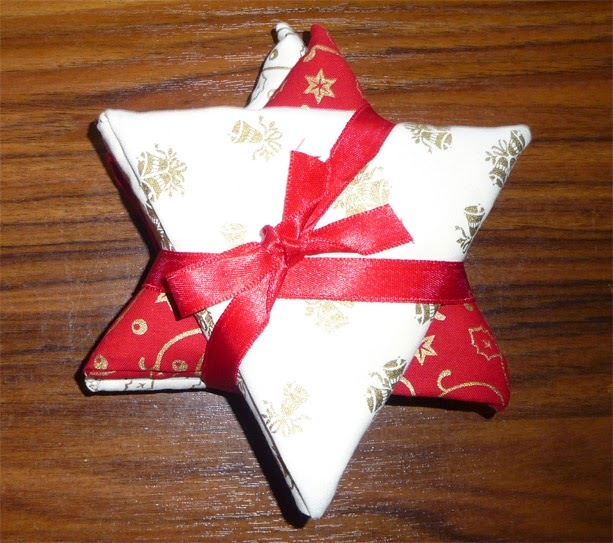 It was a very cleverly-wrapped package of fabric - yeah... Spotlight knows what they're doing. This package and a few others acquired then and afterward, well, they're aging and not doing anybody any good just sitting there. I thought that, over time, I'd find other bits and pieces to combine with them, but it hasn't happened. 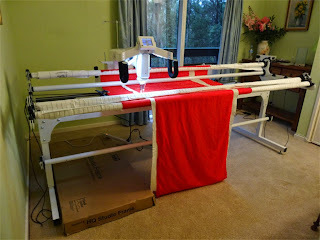 Table runners can be fun and fast projects - certainly not as involved as the queen and king-sized bedspreads I've been addicted to. 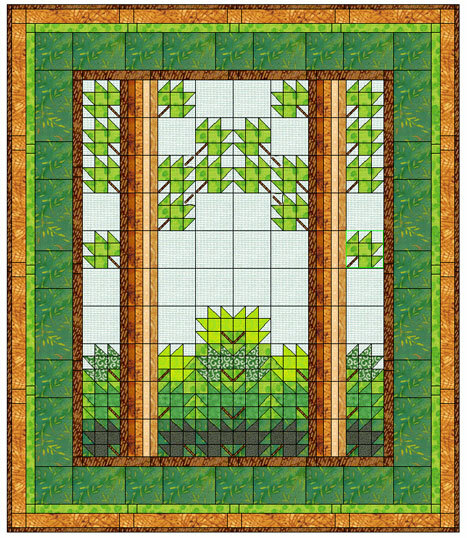 So here we go - a runner with 1" squares. Dimensions are 59" x 13". I had a ball putting it together. Now... have a good look - can you spot the goof? Yeah... the red block at the end (right side) doesn't match the 2 other red blocks. Well, you can see it easily when you are looking at it like this, but when it's actually laying on a table, no... ...you really don't see it. Thank heavens - because I'm sure not going to take this apart and do it over (I would if it were being made for someone else, but this one is for me). 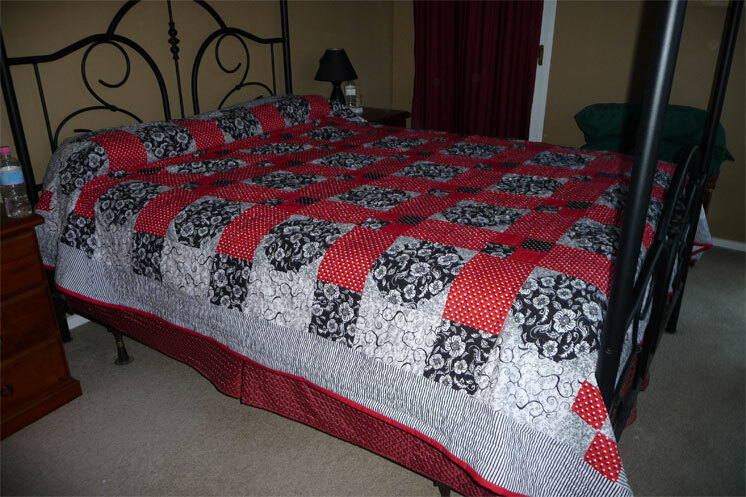 I'm planning to quilt this one on the longarm. 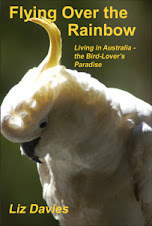 I don't look at my visitor statistics very often, but just had a glance and lo-and-behold I've gotten a few visitors coming from the blogchicks.com.au site. Welcome, friends! When, as a blogger, you register your site with these free services, you kind-of take it all with a grain of salt. I give them a bit of a run, then pull them off if they don't deliver. But blogchicks is working. Well - that makes sense. I've loved looking at other sites listed with them. Maybe that is how I should decide who I list with. Spotlight - one of my favorite stores - had a clearance on small jelly roll packs. 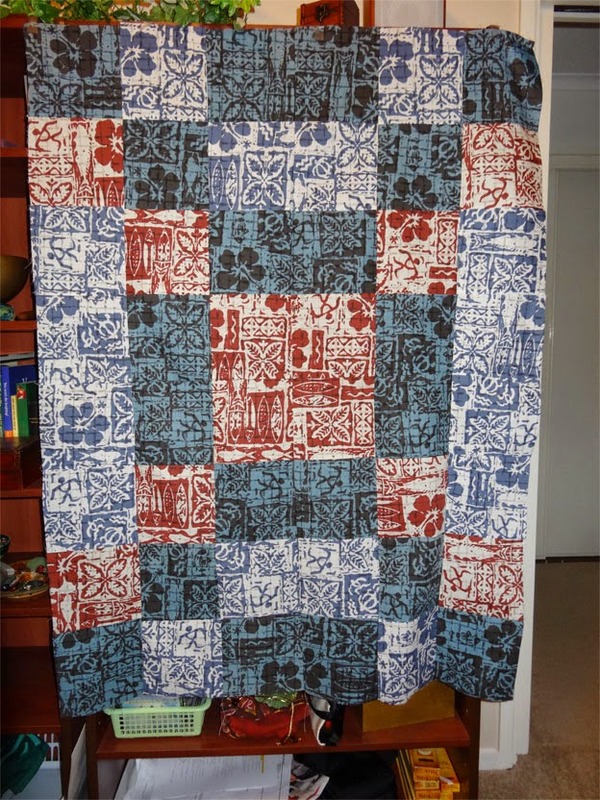 I picked up the roll which made the log cabin blocks in this quilt for something like $5.00. I don't know why I bought it - maybe a psychic "knowing" that I'd need some "throw away" projects to work on when I finally got a longarm. 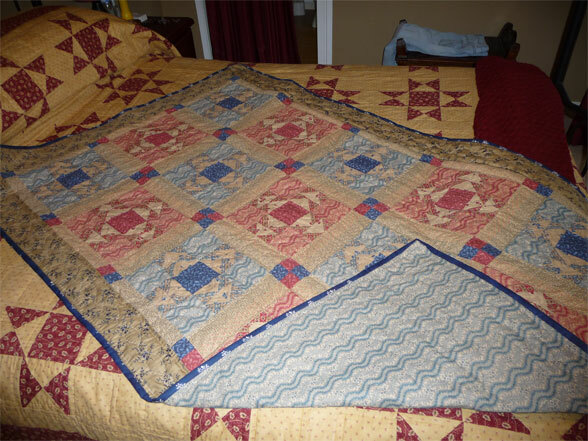 Anyway - I've had this one laying around for a couple of years, believe it or not - and only last month finished the top by adding strips to the side (to get it to a decent width) and strips on the top. 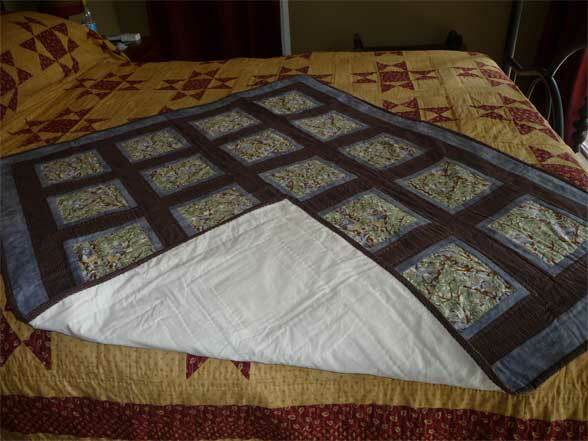 It's certainly nothing to "write home about" - but it will serve well as a practice project for the longarm. 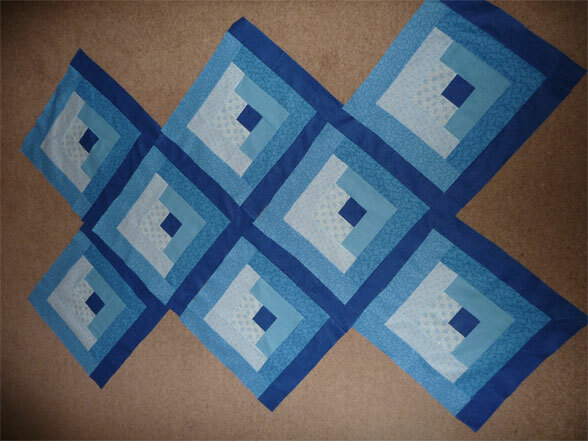 I've got this and Quilt 25 - same basic design, but with more blocks and in blue. 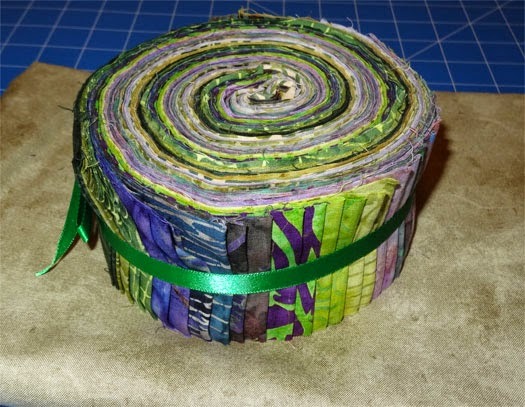 Of course I'll do my best with it, but if it turns out badly, well, there isn't much investment in this - $5 for the jelly roll, $14 for the backing, scraps for the batting and binding. 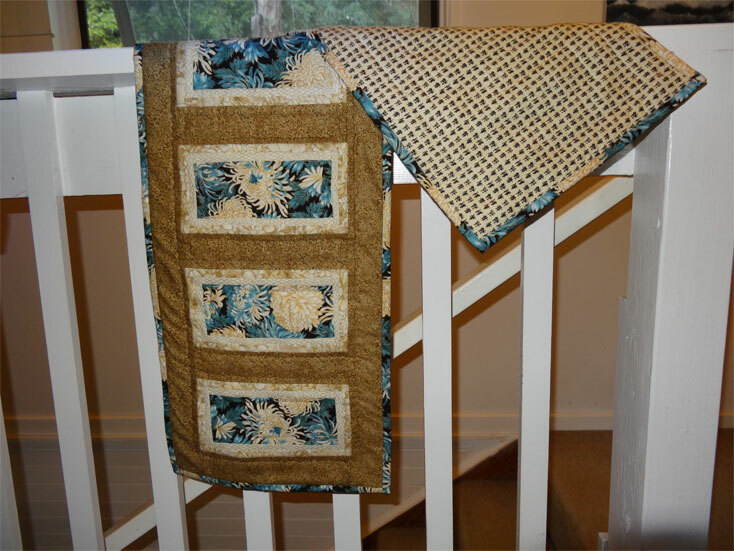 When I was preparing my "practice projects" (for the new longarm), I pulled out some fabrics in my UFO closet which had been there for quite a while. 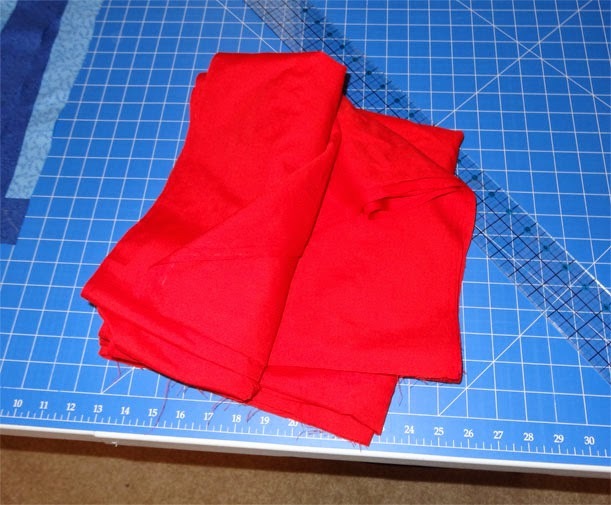 One, in particular, was 6 yards of solid red fabric. You already know where this is going, don't you?!?! So yeah - I washed it, and because I've had a bad experience with red (with my very first project, no less! ), I threw in a sacrificial white cotton facecloth. And yup, sure enough, that facecloth is now pink. 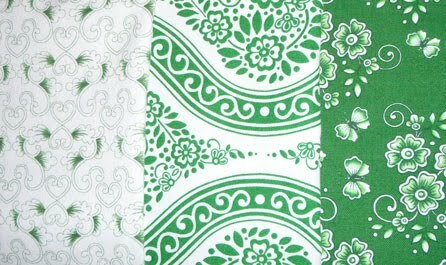 When I bought this, I also bought a similar length of dark green fabric. Was that also going to bleed? No. It came through the wash just fine - and the sacrificial facecloth tossed in with it came out as white as it was when it went in. I washed it again - same thing. 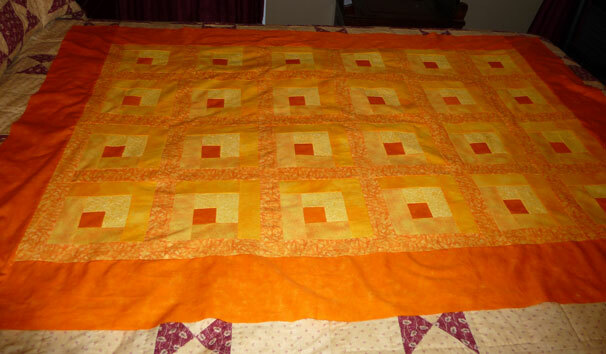 Quilting guru Pauline suggested I soak it in a water/vinegar/salt solution. So I did. Then washed it one more time. No joy. The solution certainly leeched out some of the red - but one more time through the wash and the results are the same as before. 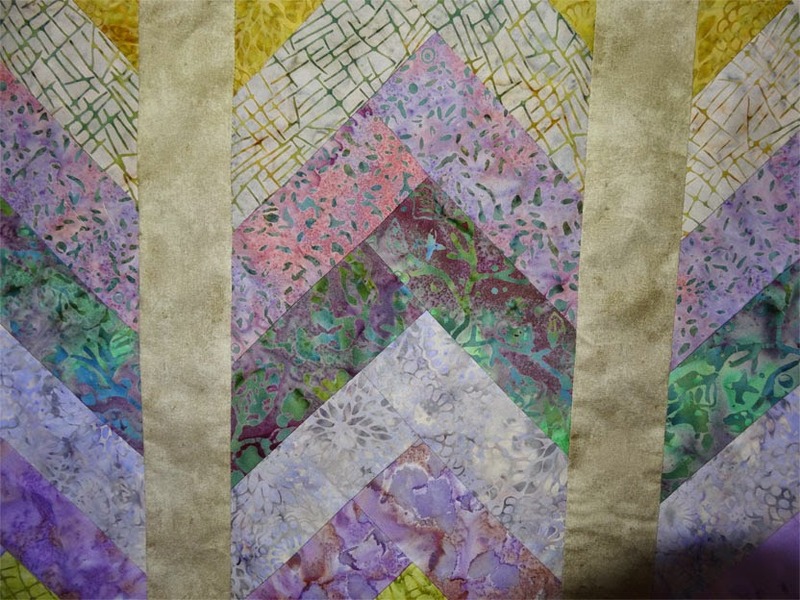 Well, the light at the end of this tunnel is the fact that I need "throw away" scraps to practice on my longarm. This will do nicely. Last Sunday morning (yes - Mother's Day, no less!) 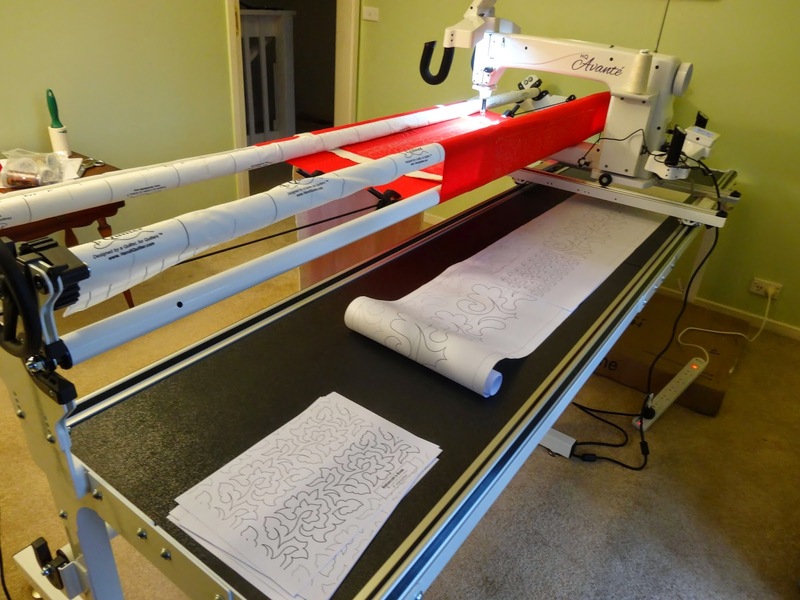 my new longarm quilting machine was delivered and set up. Oh my, what a job it was. The Howard (the dealer) and Andrew (his partner) set it up for me. Good thing they did. It took the two of them over two hours to put it together - and they've done a LOT of these installations - whew! What a lot of work. Most longarms I've seen have a frame which is 12 feet across. 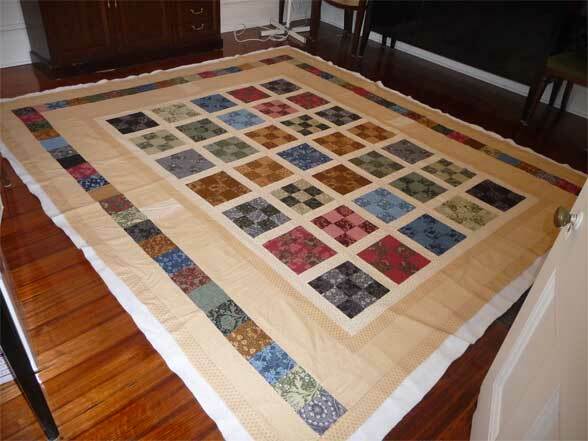 The Handi Quilter, however, has a frame which can be set up at 8, 10, or 12 feet across. This is great for someone like me who doesn't have a huge warehouse to set the thing up in. Our guest bedroom is just under 10 feet from the wall to the closet - so the 8-foot option works for me. 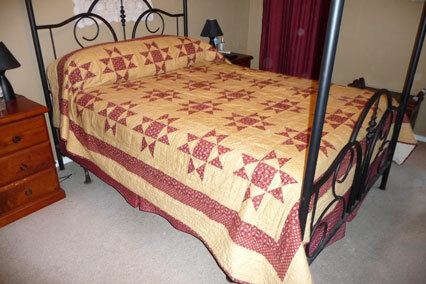 Of course, I can't quilt a king-sized bedspread on this - the frame isn't long enough. But I have plenty of projects smaller than that in the queue. I'm, frankly, surprised more manufacturers don't offer frames which are adjustable. But there you are. After setting it up, Howard gave me a short rundown on the basics - how to thread it, how to thread and load a bobbin, how to adjust the tension, how to load a quilt on the frame. He also showed me fundamental functions of the system, different stitch modes. Throughout, he gave me tip after tip, sharing his own wealth of knowledge, pointing out things that will save me loads of time and headaches. I'd watched a LOT of videos on YouTube, and I'm very glad I did. Having seen so much beforehand, I was better equipped to grasp what Howard was saying. His instructions and methods for teaching, very clear, very effective - but knowing a bit going in has helped me with retention, especially with the "tips". I guess I know enough to be dangerous now. I asked Howard about pentographs - paper templates for stitching (the second photo above shows a pantograph partially unrolled on the shelf at the back). He showed me how to attach the laser pointer and the basic technique, but cautioned me that pentograph quilting is somewhat advanced. His advice was to stick to free motion for a while and (maybe) consider looking into groovy boards. After he left, I did play with a pentograph - and got disasterous results (this is on a throw-away piece made up of scraps - see the photos below), so I'll be following Howard's advice. My first hour or so of free motion stitching was rough. 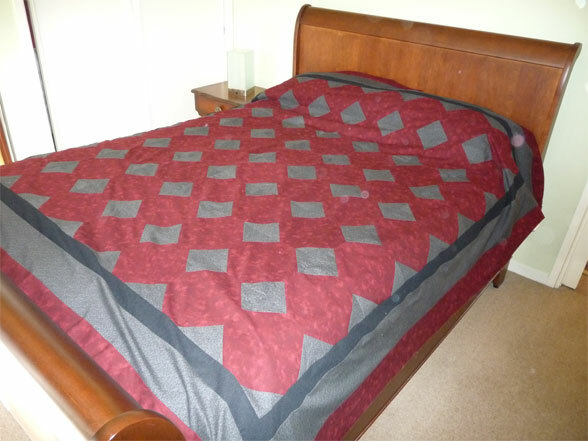 Free motion quilting is a lot trickier than it looks. But in the second hour, I seemed to be getting the hang of it. I think it was about then that I started to really relax, and that probably made a big difference. about half an inch across). Not stellar, but getting there. Even so, free motion isn't coming easily - and I'm thinking seriously about those groovy boards. Well, we'll see. OK - here we go. All projects I started and actually told you about (yes - there are some I haven't reported...LOL). Stared in 2010, and... well, I didn't get far. I think I finally just threw the pieces out. HOWEVER... I've not actually combed through my entire stash of UFO's, so it might still be around to haunt me. Modified Snowball Kit - "Forbidden Temple"
Started in ?, completed in 2013. Status: Pieced and ready to sandwich. 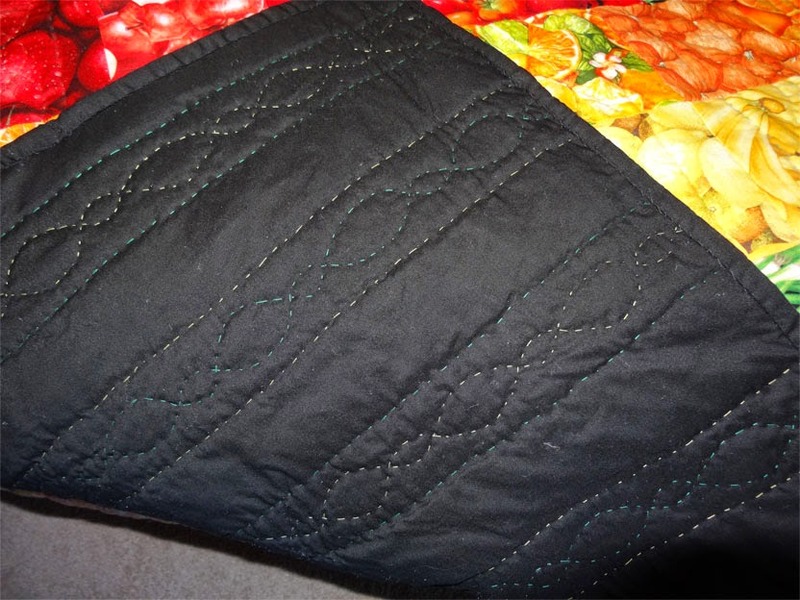 Started 2013, currently being hand quilted. 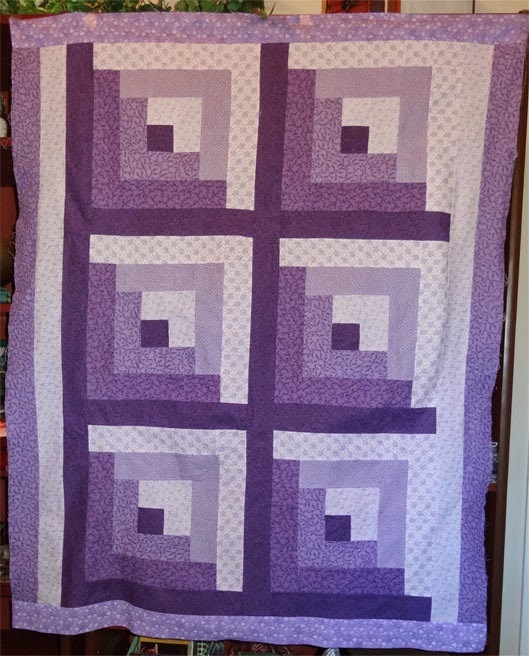 Started in 2015, currently sandwiched and awaiting hand-quilting. 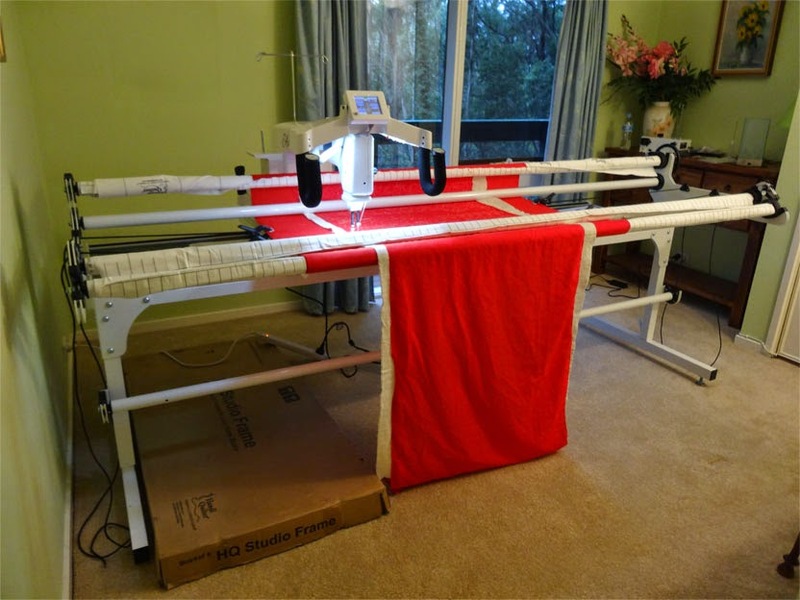 Started in 2015, top is assembled and planning to use this as one of my first longarm projects. So, there you have it. Those are the ones I told you about. Next to catch you up on the projects I haven't mentioned yet. 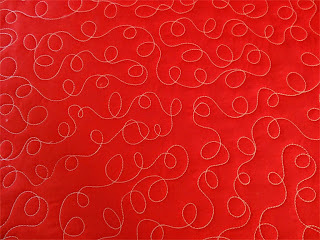 After looking over past posts on this blog, I suddenly realized that I forgot to "number" some of my recent projects. And with that, well, I've lost count of how many I've completed. In early 2011, I posted a review of the projects I'd worked over the previous 12 months. Doing that was an interesting exercise. I think I'll do that again - and put numbers on the projects that don't have numbers now. I guess it's a sign that my UFO closet has grown to epic proportions. Yes, I officially have too much uncut fabric now. And how did I reach that conclusion, you ask? 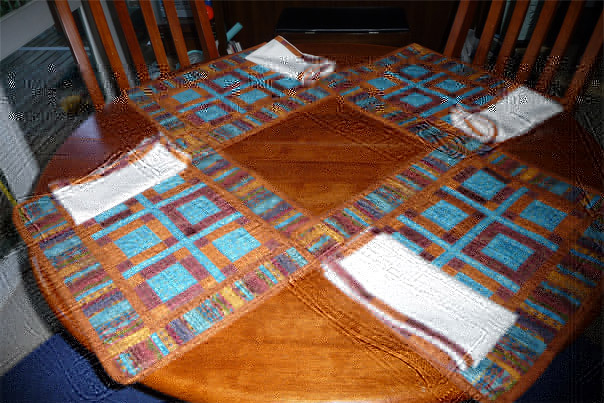 It's the Thanksgiving table cloth I started in 2013, reported in this blog post from November of that year. 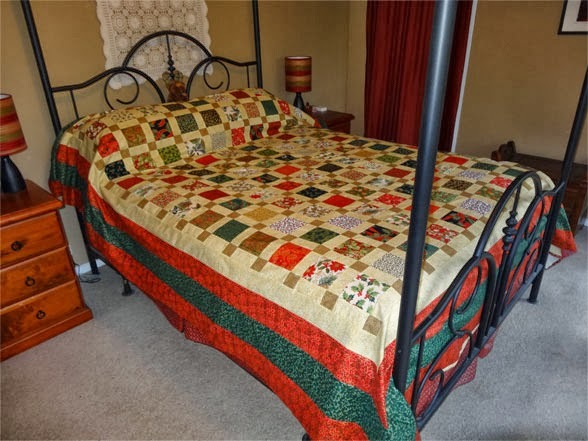 It's made of "charm squares" I'd purchased at my favorite quilt supply shop. I pieced it together fairly quickly - at least the center of it - but hadn't gotten around to putting the borders around the edges. I didn't notice right away that it was gone. The summer of 2013/2014 was a little rugged for us, with a rather trying "fire danger period" - and so I moved most of my UFO closet stash down to the city for safe keeping. 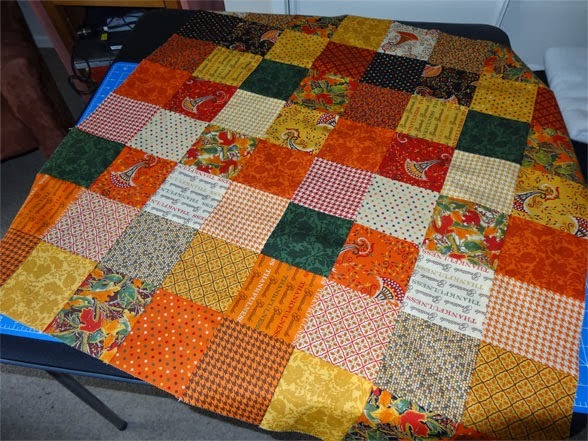 I did a little bit of quilting that summer, but was working mostly on piecing things, and so didn't think about the table cloth until winter arrived in June. And I couldn't find it. WHERE THE HECK WAS IT!?!?!?! I looked and looked. As I searched, I became painfully aware of how much fabric I actually have - and what a long process it is to go hunting through it for something. Finally - this past summer, I stopped looking. That, of course, is when it turned up. So it's back - my "Thanksgiving" project. Now to put some borders on the tablecloth so that it's big enough to cover my dining table - and get on with the project. Now... where did I put those Christmas "fat quarters"...? 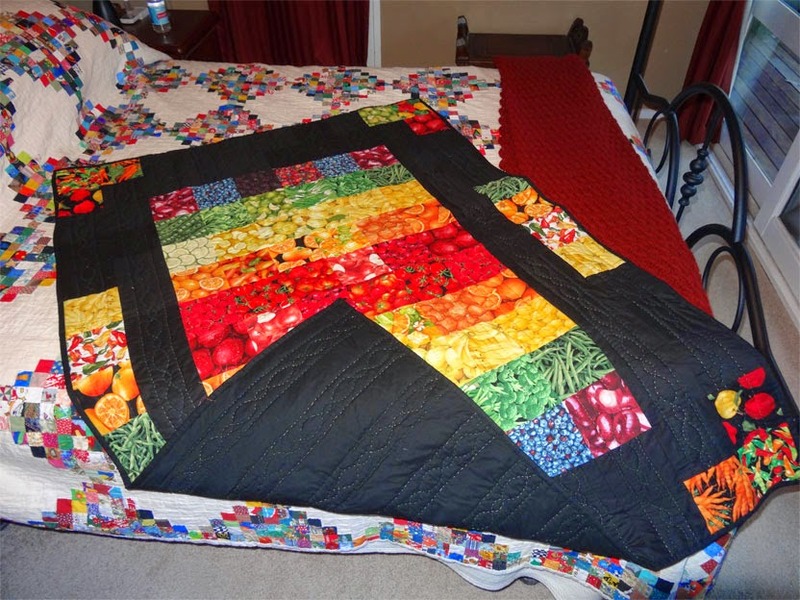 Quilt 19: Tutti Fruity "Throw" - Finished! 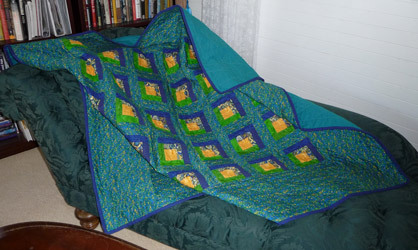 I'm delighted to report that the Tutti Fruity "throw" is finally finished. 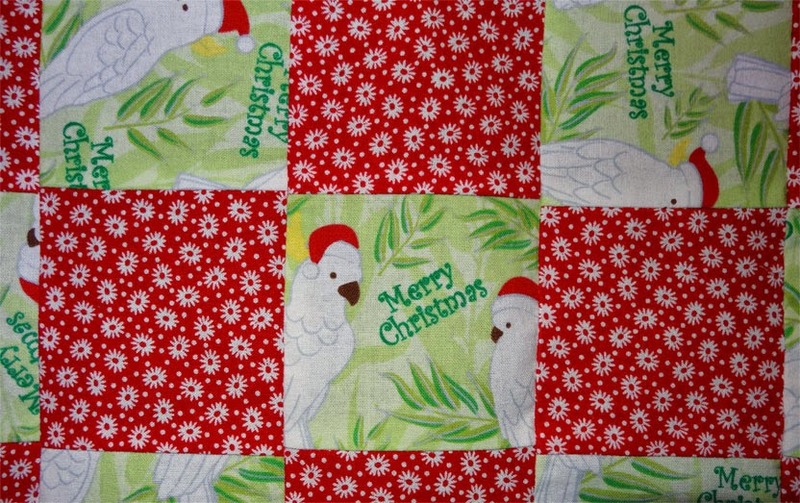 I'm really proud of this one - a design I developed using charm squares I picked up on my 2012 visit in Florida. 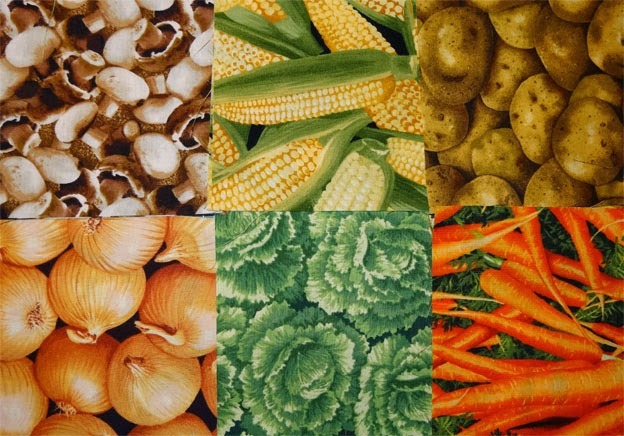 It took a while to decide what to do - I wanted the colours to really pop, so came up with this "rainbow" arrangement (in the center), and using black borders to highlight the intensity of the fruits and veggies. 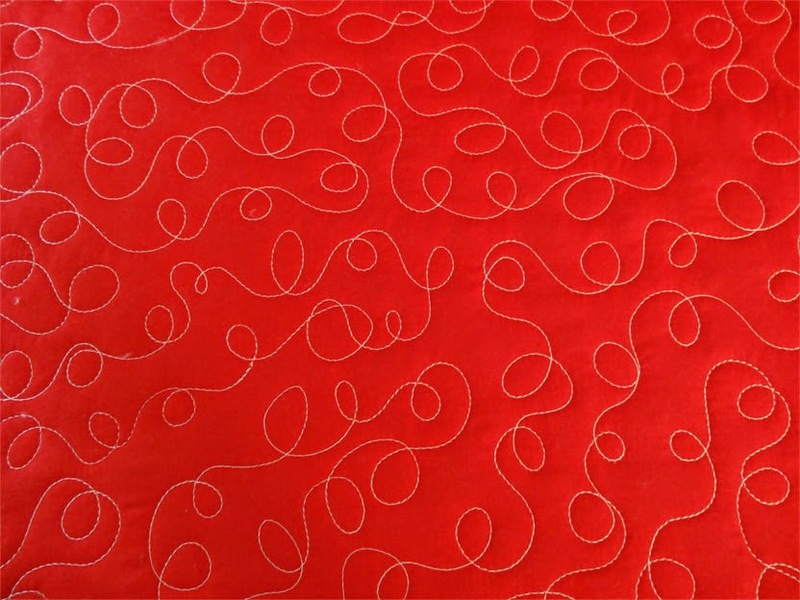 I opted to use a stitching template to get swirls. I've used this template before with good results. 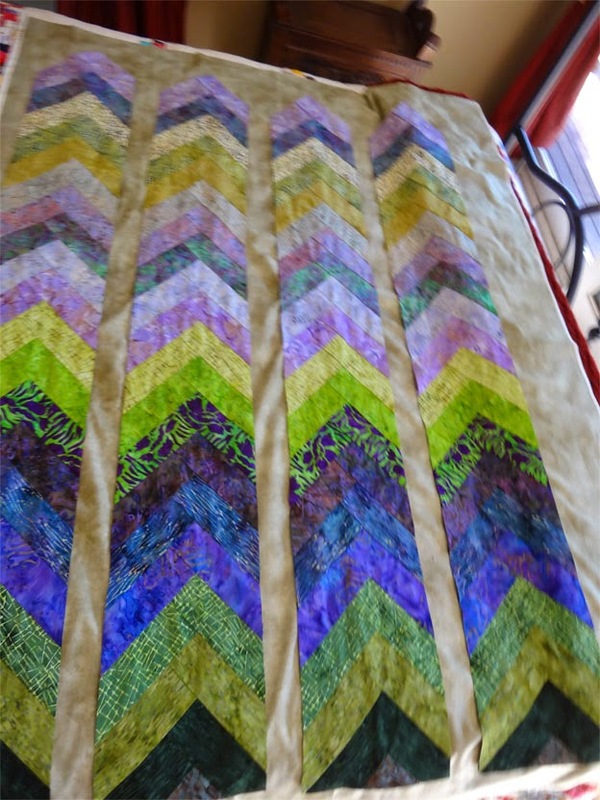 This time I opted to use 2 shades of green thread - and to add a little more interest to the back, alternated on which of the 2 shades I used for the swirls and straight lines. (You'll probably have to click below and get the larger version of the image to see the alternating colours). So there you go! Another one done!